I finally figured out how to make the perfect pork chops. 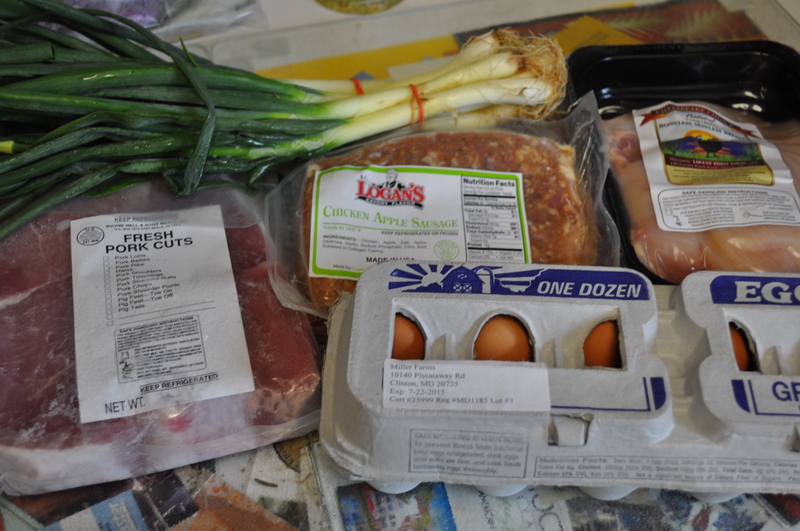 It’s only the third or fourth time we have gotten chops in our Friends and Farms order, or in the meat share from the CSA. This was yesterday’s protein and dairy bag. From Wayne Nell and Sons, four large beautiful boneless pork chops, extra thick. As for the rest of the basket, we are getting eggs again from Miller Farm in Clinton MD. A nice changeover to really farm fresh eggs instead of our regional winter supplier. We got some chicken apple sausage from Logan’s, in Baltimore. And, boneless skinless chicken breasts from Locust Point Farms in Elkton, MD. Instead of milk, as usual, I got my weekly substitute “extra produce”. An option for those who don’t drink milk. Two bunches of scallions. 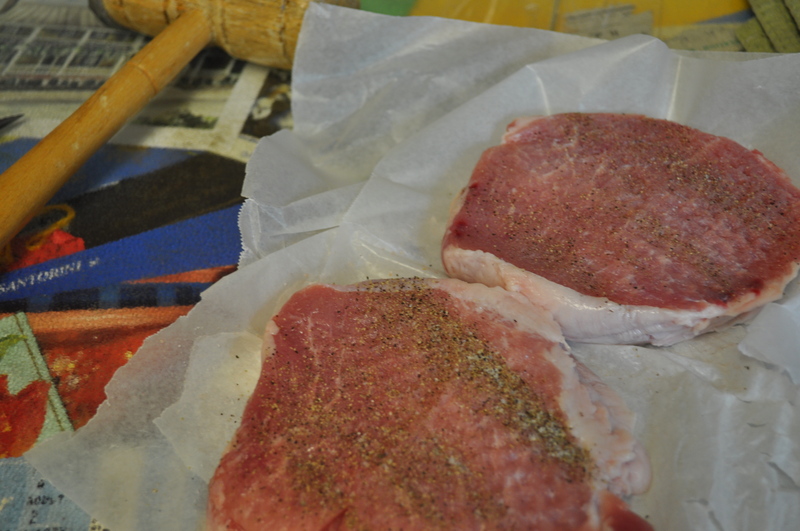 As for those pork chops, I took apart the package and vacuum sealed two of them to freeze for later use. The others. I pounded them with my mother’s old meat tenderizing mallet. Breaking them down a bit and getting them both to the same thickness so they would cook at the same rate. Nothing on them but salt and pepper. Pan fried in light olive oil. Very high heat to sear. Finished under a lid with a splash of white wine to deglaze the pan and get the centers to that perfect state of doneness. Then, I forgot to take pictures. So there is no “after” shot. Still, my husband declared them to be the best I have ever made. They weren’t tough anywhere. They weren’t chewy. They were moist and flavorful. I served them with the last of the cabbage from a month or so ago. I kept that whole cabbage in the fridge, and I slow cooked it in chicken stock in the oven. Falling apart. 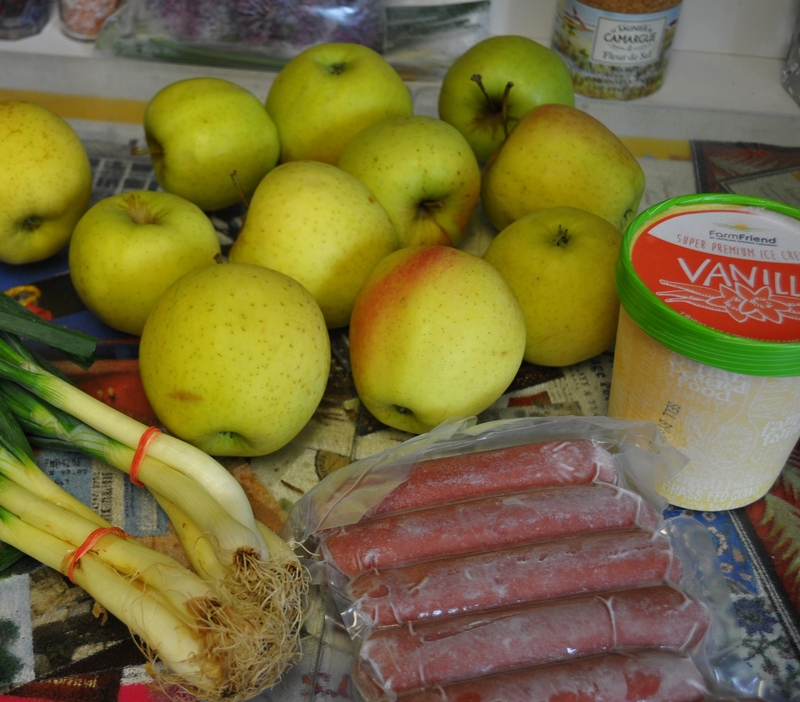 I also got a bag of apples as an add on this week, and baked two of them to use as a side for the pork chops. These were the add ons this week. Five pounds of apples. A pint of vanilla ice cream to use with some of those strawberries around here. Sechrist Brothers beef hot dogs. Because sometimes you really want to grill hot dogs and hamburgers and these all beef hot dogs are just awesome. Posted in Farms, Food, Friends and Farms, Local Businesses, Locavore, Real Food and tagged cooking, Food, foodie, local businesses, Locavore, real food. Bookmark the permalink. Like you, I’ve been challenged with chops. My husband’s favorite outcome was when I brined them in advance. I keep trying things. The pounding and the searing on very high heat, followed by a quick fry seems to be my best method so far.